You don't need to know rocket science to know how spare tires works. If you have a car, chances are you already came across these things strapped on the outside of your car, or whatever location the manufacturer decided to put them. They normally come in smaller than the existing car tires with good reason, but some come in with fancier styles, frequently matching with the rest of the wheels just in case you don't want anyone seeing you in these. Spare Tires – How Long Do They Last? Spare tires either come in at full size or small ones like donuts. If there ever was a more accurate reading of how long do they last, then look no further than the owner's manual that came in with the car. When is the last time you took a look at your manual anyway? You might be driving the same car for the last ten years without knowing it came with an ejector seat attached! A Donut tire is a term used for the smaller, temporary tires that normally comes free with the vehicle upon purchase and are intended to be used with a very specific role in mind. You see, the fact that they are smaller and way thinner than your average wheel means they are less durable and highly likely to cause damage to your transmission over time due to its faster rotation speed. They are intended to be used only to get your vehicle to the repair station and get patched up and running again. They are not designed to run long distances. They normally have an average distance of 70 miles, anything going higher than that is asking for trouble. Donut Tires – How Fast Can They Go? Donut tires, like the most spare tires, should only be driven at no more than 50 miles per hour. This is because, to save space, they were designed with very little tread. As a result, they are quite vulnerable to road hazards. For a more accurate speed limit, most tires come with stickers plastered in the middle that indicates the maximum speed capacity. Full-Size Spare Tires – What About Them? Full-size tires are bigger than donuts and are designed to minimize transmission damage when being temporarily used. However, some of them are also thin and have the same distance limitation. And then there are the heavy duty spare tires that are made to replace the damaged tire totally. They are bigger and tougher and share the same tire model as your car's. You can already count this as your fifth tire! The thing is, with these heavy-duty ones, is that they are heavier and way thicker than the full-size tires, taking up more space and further weighing down your vehicle. Despite having the best protection, modern day main battle tanks can still suffer severe damages when going headlong into battle. The same goes for your beloved tires. They may have state-of-the-art technology built into them, but they are nothing against the ravages of time. Or a simple nail is sticking out of the ground. Anyways, there will come a time that you will have to use this. You may not like the look, you may not like the effort, and you definitely may not like the car repairman, but you have to do it. Your vehicle can only count on you during these dire times. So let's say your car just decided to have alone time with you, or with your family, and popped a tire. Being the responsible driver that you are, you decided to get out and start the repairs. You could also wear gloves; bring a flashlight just in case, a block of wood to make sure the jack stays in place, or maybe a raincoat. Step 1: Find a safe spot for replacing the tire. Don’t just stop anywhere. Turn on your hazard lights. Make sure you apply the parking brake. Remove the wheel cover and then loosen the lug nuts. Make sure to only loosen it until you are already able to rotate them by hand. To avoid damages to your car when using the jack, look for a conspicuous area near the tire that conveniently matches the jack head. Or you could refer to your user manual. Slowly lifting up the car with the jack, remove the tire. The lug nuts should now be ready to be removed by hand regarding looseness. Get the spare tire and place it in, again making sure the lug nuts are still loose. 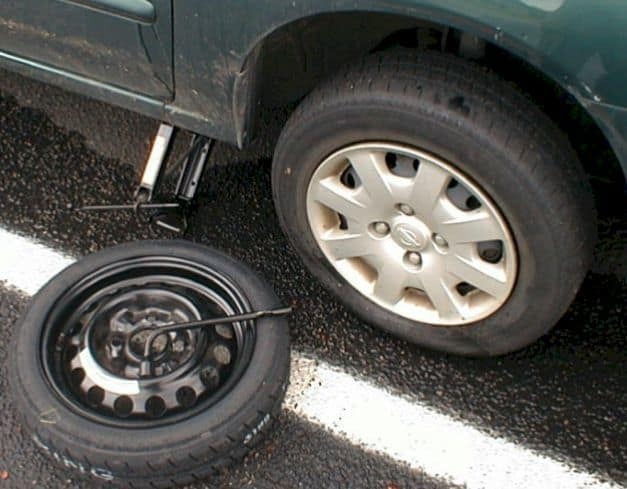 Gently lower your car back to ground level then use the lug wrench to screw the lug nuts back in place. And after this, you should probably pat yourself in the back because this is it. You just unscrewed a tire and screwed another one in. Always make sure your car is in tip-top shape before heading out. You may never know when it decides to have a one-on-one with you again. Check the air pressure on the spare tires. With modern tires lasting up to a decade, you may have already forgotten the little guy sitting on the roof for so long. So after a puncture, make sure to check the air pressure before plugging it in. Remember the limits of the spare tires. You are not allowed to go on a long road trip with them. Consult the owner's manual for some additional hints on tire replacement. Some cars are just really special. That was that. 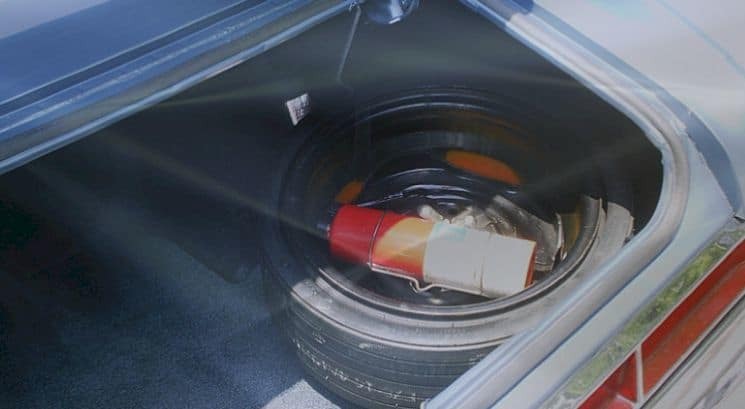 You now know your spare tire.